Local Realtor and businessman Bill Parsley, Partner in Parsley and Todd Realty and Auction llc, is turning a life-long passion into a way to help others enjoy their kitchen and take the fear out of cooking fine cuisine at home. Cooking has been a big part of his life and in his spare time has been attending the Art Institute Culinary School in Nashville. A journey that was started just for fun has grown into a way to help others advance their culinary aspirations. 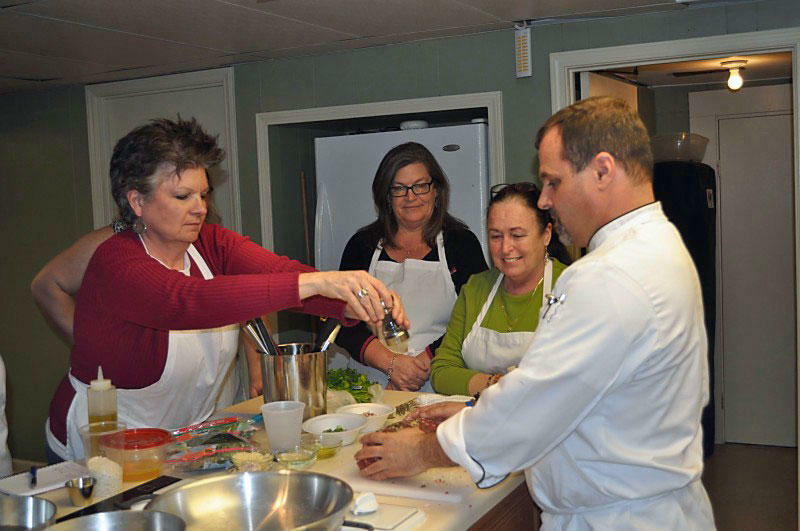 After talking to several friends and ladies around town he decided to try a beginners cooking class here in Woodbury. With the help of the local agricultural extension office and their teaching kitchen eight local aspiring cooks have attended the first in a series of beginners and soon to be more advanced cooking classes. Topics covered include basic knife skills, selecting and preparing fresh vegetables, proteins, seafood and sauces, using fresh herbs, spices and wine in preparing their favorite dishes. The first class was a series of four classes broken down into one night of knife skills and cooking eggs in every way possible, the second night was covering and preparing the five mother sauces, the third night was a fun night of just cooking, sautéing vegetables , chicken seafood, and fish. On the final night the class prepared and plated several dishes covering everything that had been learned in the first three classes. Roasted beef tenderloin, with a demi-glaze and mornay sauce, sautéed honey glazed green beans, tomato basil marinara on rigatoni and risotto with portabella mushrooms and asparagus tips. The objective of the class is to give the beginner and not so beginning cook the skills to prepare their favorite recipes combining fresh ingredients, spices, herbs and wine with proper cooking temperatures and times to create healthy and timely dishes. The next in the series of classes will be a one night seafood class in March and then the beginners series of four classes will be held in April. Bill Parsley is also available to host cooking classes in your home or even to prepare a dinner of fine cuisine in your home. He is also currently cooking at Blue Restaurant and Bar in Murfreesboro besides being a full time Realtor and Auctioneer with Parsley and Todd Realty and Auction llc. Those interested in attending or hosting a class can contact Bill Parsley on Facebook or through the Cannon Courier.